From talented new voice, Samantha Wheeler, comes Smooch & Rose, an inspiring tale about one girl and her fight to make a difference for koalas. When Rose and Gran save a baby koala from a pack of blood-hungry dogs, he's named Smooch, because he loves to cuddle. With the help of wildlife carer, Carol, Rose and her dog Lizzie look after Smooch until he is old enough to make the trees on their strawberry farm his home. Rose is deliciously happy – caring for bush babies is her dream come true! But things change for the worse when Gran gets a letter from the bank. Does this mean they have to sell the farm? Then Uncle Malcolm mentions bulldozers and Rose realises it's not just her home that's at stake. She has to do something, and fast! Rose has a voice and wants to make a difference but what can one girl and her koala do? Samantha was inspired to write this book for children out of concern for one of Australia's most endearing animals. While there are a number of threats facing koala populations, from disease to the rise in carbon dioxide, Samantha wanted to highlight the serious issues of encroaching suburbs, loss of native trees, and the vast number of dog attacks. In 2011, Samantha made a shocking discovery. Her daughter's school sat opposite a paddock of tall leafy gum trees, home to a lovely healthy koala. Each morning she'd search the trees hoping to catch a glimpse of him. He was also a favourite attraction for tourists on their way to the Stradbroke Island ferry. -One day I arrived to find not one of the trees were left! An empty paddock of broken branches and upturned trunks stared back at me. I couldn't believe it. I Googled koala trees as soon as I got home and found there were all sorts of loopholes that allowed this sort of thing to occur. Several phone calls later, I discovered that this wasn't the first time something like this had happened,' she said. Younger readers will delight in this story with heart, especially Rose's love for animals and her courage and determination to fight the developers out to destroy everything she holds dear. Samantha Wheelerlives in Brisbane with her family and many animals. Her first story took shape during a writing course at the Queensland Writers Centre in 2009 and was accepted into the inaugural Allen and Unwin Children's Manuscript Development Program in 2010. She went on to have a short story published in the One Book Many Brisbane's anthology and to write Smooch & Rose, her first children's novel, inspired by a local strawberry farm and her concern for Queensland's koalas. 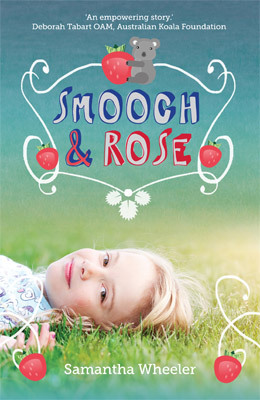 Question:What research did you do prior to writing Smooch and Rose especially for the useful guide at the end of the book? Samantha Wheeler: I started by talking to extensions officers at Redlands City Council and asking them what the rules were for clearing koala trees. They told me that unless the tree was specifically marked (VPO), or had a koala in it at the time of clearing, there was no law preventing the tree from being cleared. I also spoke to the Koala Action Group, Daisy Hill Koala Centre and Australia Zoo to ask about the wider implications of what I had seen. I visited Lone Pine Sanctuary to view koalas and their behaviour. Question:What originally inspired your concern for Queensland's koalas? Samantha Wheeler: I was inspired to write Smooch's story after finding a healthy stand of gum trees had been cleared for development near my daughter's school. I couldn't believe this was allowed when koalas so clearly lived in these trees. Question:Does your daughter share characteristics with Rose? Samantha Wheeler: To be honest, Rose was mostly developed using the characteristics of some of my Ronald McDonald Learning Program students. These amazing kids have all overcome serious long term illness and show great bravery and strength of character in the face of overwhelming situations. Question:How much of your inspiration comes from real life and real people? Samantha Wheeler: Absolutely all of it! As a kid, I loved reading real stories: Gerald Durrell's 'My family and Other Animals" was a favourite, so I wrote a story that could have happened to any one of us, all inspired by what really happens in life. Question:There are several issues raised in this book. Was this deliberate or did the story evolve this way? Samantha Wheeler: I think a bit of both. I was very keen to show what was happening to koalas in areas like the Redlands, and to inspire kids to feel their voice is very important in saving animals like the koala. But the way Rose handles bullying and other issues just sort of evolved as I told her story. Question:What do you hope readers take away from this story? Samantha Wheeler: I hope that readers will feel empowered. That no matter how big or small you are, when something really matters to you, you can make a difference!